It’s very frustrating to write about the minimum wage. How often can you make the elementary observation, after all, that you’ll get more unemployment if you try to make businesses pay some workers more than they’re worth? But it’s my mission to promote economic liberty, so I’ve written on why government-mandated wages can create unemployment by making it unprofitable to hire people with low work skills and/or poor work histories. And I’ve attacked Republicans for going along with these job-killing policies, and also pointed out the racist impact of such intervention. But I guess I’m the Sisyphus of the free-market movement because once again I’m going to try to talk some sense into those who think emotion can trump real-world economics. Let’s start by citing some new reasearch. States are allowed to increase minimum wages above the federal level. This creates interesting opportunities to measure what happens to employment when the national minimum wage is increased, since the change presumably doesn’t impact states that already are at or above that level. Two economists from the University of California at San Diego took advantage of this natural experiment and examined employment changes in states that were “bound” and “unbound” by the law. …we find that minimum wage increases significantly reduced the employment of low-skilled workers. By the second year following the $7.25 minimum’s implementation, we estimate that targeted workers’ employment rates had fallen by 6 percentage points (8%) more in ‘bound’ states than in ‘unbound’ states. …Over the late 2000s the average effective minimum wage rate rose by nearly 30% across the United States. Our best estimate is that these minimum wage increases reduced the employment of working-age adults by 0.7 percentage points. This accounts for 14% of the employment rate’s total decline over this time period and amounts to 1.4 million workers. A disproportionate 45% of the affected workers were young adults (aged 15 to 24). Gee, what a surprise. Fewer jobs. But the mandated hike in wages didn’t just reduce employment. There were also negative effects on income. We find that binding minimum wage increases reduced low-skilled individuals’ average monthly incomes. Targeted workers’ average incomes fell by an average of $100 over the first year and by an additional $50 over the following two years. …We provide direct evidence that such losses translate into meaningful reductions in upward economic mobility. Two years following the minimum wage increases we study, low-skilled workers had become significantly less likely to transition into higher-wage employment in bound states than in unbound states. This evidence on income is particularly important because some statists make a rather utilitarian argument that it’s okay for some people to lose jobs because others will benefit. Jared Bernstein is Exhibit A, as you can see in this debate we had for CNBC. But let’s not just focus on numbers. There are painful human costs when low-skilled workers are priced out of the labor market. Here are some excerpts from a column in the Wall Street Journal about a real-world example of people losing their jobs. It’s well-established in the economic literature, if not in the minds of proponents of these laws, that the result will be job losses. Yet this empirical reality fails to capture the emotional reality of the employees who are let go, or of the business owners who had no choice but to let them go. …Michigan’s minimum wage rose in September to $8.15 an hour from $7.40 (the minimum wage for tipped employees rose 17%, to $3.10 an hour). The wage will rise to $9.25 by January 2018. Now let’s look at the impact on a non-profit restaurant that helped disadvantaged people. The staff at Tastes of Life was made up of recovering addicts, recently incarcerated individuals and others who would have a hard time landing a job elsewhere. Mr. Mosley explained that on-the-job offenses for which an employee would have been “gone that day” in a traditional work setting were instead used as training opportunities at Tastes of Life. …Mr. Mosley’s financial goal was to break even and use any excess funds to subsidize Life Challenge participants. After more than two years of operation on Beck Road, 2½ miles from the center of town, Tastes of Life had a steady flow of loyal customers, but rising food costs presented a challenge. …Mr. Mosley and Ms. Tucker had planned to print new menus with higher prices to cover the food costs, but the September wage hike complicated those plans, in particular because the increase covered both tipped and non-tipped employees. …“If we had a $10 menu item, it would have to be $14,” Mr. Mosley said. The restaurant’s customer base of seniors on a fixed income and Hillsdale locals made this option a nonstarter. The restaurant also had to find roughly 250 new customers a month, unrealistic in a small town of about 8,300. Understanding “unintended consequences” is a key characteristic of a good economist. Indeed, Bastiat’s wise words about the “seen” and “unseen” help to explain why Krugman makes so many mistakes. But that’s a topic for another column (actually, a whole series of columns). Today, the goal is simply to understand that it is pointlessly destructive to make low-skilled labor less affordable. P.S. Given all the evidence that minimum-wage laws destroy jobs, why do some people persist in supporting such a destructive policy? In this post, I provide six possible reasons. P.P.S. No wonder I get so frustrated on this topic. 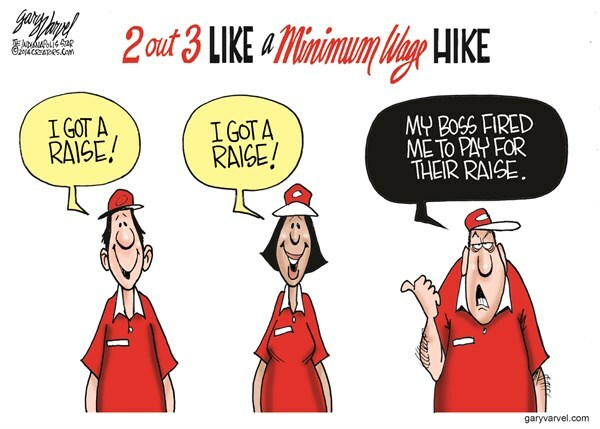 P.P.P.S On the lighter side, here are some good cartoon on the minimum wage from Steve Breen, Lisa Benson and Henry Payne. Is this not perfectly obvious? Nobody wants to be broke financially. The only problem is that minimum wage laws create barriers to success. Sadly we just passed a big increase to the minimum wage law in Arkansas and my argument against it is the same as Milton Friedman’s. If a $10 wage floor is good then why not $100? Just to clarify, Nedland is my first name, Ned for short. Thanks for your support. Gotta agree with Mr. Nedland’s response to Clarence. By your reasoning, Clarence, it makes no sense whatsoever to stop at $10 per hour. We could simply solve all economic problems by boosting the minimum wage up to $50 per hour. Yes, NYC is an expensive city. Do you really think anyone there would accept a job at $7.25/hr? Market forces have driven labor prices higher and there is no need for minimum wages laws. On the other hand, a $7.25/hr job in Montana might be good compensation, with the cost of living at rock bottom. Given the differences in living costs why have a federal minimum rather than state minimums [not that I like those either]? You are right that the CEO would not be affected by a $2 raise. He’s not the decision maker for low level salaries. Also he’s not the one who will see the price of his hamburger or chicken happy meal go up substantially. How rich are these people now that you’ve ensured their earnings are $0 without a job? You’ve erected quite a straw man and worked hard to make sure you don’t understand even a little bit on the arguments put forth in the above post. It takes hard work to be as obtuse as someone would need to be to make the inane comment you’ve made. I agree, minimum wage means “minimum”, meaning that of course you can’t live off of it. However, it is still unreasonably low. The prices have inflated over the last 40 years and minimum wage hasn’t gone up much to accommodate inflation. I think minimum wage should be $10/hr. It is brutal for servers to make $2/hr in some states, or to try to live off of $7.25/hr in an expensive place like New York City. Honestly, it wouldn’t kill CEOs of large corporations to raise the minimum wage by $2-3. They’ll still be multi-millionaires. Many of them do work for nothing. My daughter’s friend, a recent straight “A” college grad, was working for a MA agency on hiking the minimum wage. At the time, she was working in an “internship” program and earning nothing. This could only make sense to a liberal or a recent college grad. Imagine how rich we’d all be if these people worked for nothing. Increasing the minimum wage has no net effect on the economy. 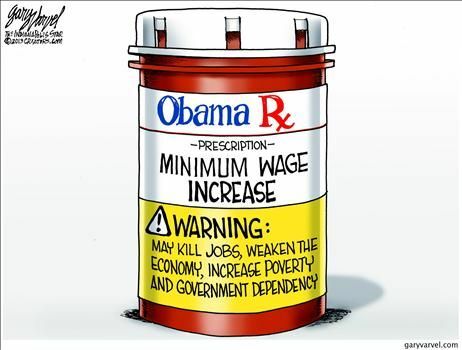 A $1/hr increase is a $1/hr decrease for the business owner, unless he can shift some or all of the cost to the consumer of his product or service. Seen vs. Unseen. When you consider total aggregate compensation paid to minimum wage earners, the amount increases as the minimum wage climbs. Yes there are layoffs that affect a small minority as well as increased employment uncertainty for those remaining employed at the higher wage. But these losses do not fully compensate for the wage increases enjoyed by the majority that remains employed. And we all know what happens when a minority collides with a majority: The majority can extract huge sacrifices from the minority(layoff), for marginal benefit (a 10% wage increase). So the minimum wage issue is emotion over logic only for those NOT earning the minimum wage. Those earning the minimum wage, as a whole, WILL extract more compensation from the rest of society for their services (and make society overall less competitive on the worldwide stage inviting entrance into the death spiral of systemic decline — but that is another story — though the only relevant story in the end). So since, as a whole, minimum wage workers are able to increase their aggregate compensation through a legislatively mandated minimum wage, minimum compensation laws are simply a redistribution scheme to have some people earn more than they are worth. Never mind that a minimum wage in America puts you in the top 20% of the worldwide prosperity ranking. I want MORE. Why? Because I can! I vote, therefore I can decrease the worldwide competitiveness of my nation and flirt ever closer with the vicious cycle of decline. Because as my country starts declining and I get economically stressed out seeing workers in other nations starting to catch up to my American minimum wage, what do you think am I going to do? Ask for an even higher minimum wage, of course! But it’s no surprise why minimum wage earners support mandated pay floors, since they will aggregately extract more compensation for their services, in spite of the lesser collateral damage in the form of layoffs and decreased employment stability. The bigger question is why are people who are NOT minimum wage earners supporting the minimum wage? Because other people above the minimum wage have their own redistributionist agenda and so all redistributionists must join forces, as a matter of tactic, to form an electoral monoblock. An electoral monoblock of voter-lemmings who will systemically undermine the competitiveness of their nation for the immediate but corroding effect of redistribution. Why? Because a redistribution dollar today is worth five perpetually compounding prosperity dollars in a future aspired by Mr Mitchell and his followers. Hence, the growth rate of most developed democracies in the world keeps trailing the worldwide growth rate by several percentage points and the trajectory of decline in these democracies continues as the once enviable prosperity of their citizens gets absorbed into a worldwide rising average. There seems to be few exceptions from this rule, so the voter-lemmings of these societies will eventually have to square off with odious regimes and Putin juggernauts, as totalitarian regimes also evolve. When, as a voter, you follow such a detrimental policy, at some point you’ll have to square off with the Putins at your borders, or beyond and you also have to face the fact that your once enviable prosperity is steadily been absorbed into the world average. This is the process American voter-lemmings grave unleashed iponutrizione themselves. Maximum economic efficiency which achieves growth rates above the world average (very-very few democracies manage that today) remains the only long term reliable policy for prosperity — and for defense which is ultimately a consumer of a portion of this prosperity. Without a robust growth rate, nothing is sustainable. No military, no redistribution, no coveted government services, no above world average standard of living, nothing. The decline continues at varying rates. So in the short ephemeral periods when growth jumps to 3%, and hence we are trailing worldwide growth by only one percentage point, everything seems rosy again, and its time to deal a blow to our country’s competitiveness by increasing the minimum wage. Wiser people with a more worldwide horizon will use this time of relative euphoria to work on their safety boats while the masses are hypnotized and the safety exits still unjammed. Liberal: (paraphrased) I’m willing to sacrifice the employment of 500,000 people in order to give a raise to other people. Now, I’m not going to give them a raise, but I will take credit for forcing their employers to give them a raise, but will not take the blame for those who lost their jobs. Mitchell: (paraphrased) I want the government to get out of the way so more people can work at higher wages. McCargar: How is this even open for discussion? This is a 40% increase. Added Billions to the economy increases help to produce and service it. GDP grew by 85% quickly under Clinton’s increase. Lost in the discussion of minimum wage is the churning effect. Statistics cover the net employment losses, however, that understates the negative effect on the lowest skilled workers. For example, at $8 an hour 20 employees might be employed. A boost in the minimum wage to $15 radically changes the mix. The employer automates. Maybe 2 of the existing workers are capable of the new responsibilities, which require language skills and technical knowledge. Luckily for the employer the higher wage is enough to attract people with the required skills and 8 new employees are hired. The net change in employment is 10 lost jobs, but lowest skilled employees lose 18 jobs. More qualified new hires displace 8 of those jobs. Whether the employer is better or worse off from the forced automation and improved quality of workforce is impossible to know, however, those employers that are worse off risk extinction and the loss of all previous jobs. Employers will be forced to adapt to the new requirements, however, some of the adaptation may involve going out of business. All of the adaptation will be negative for employees that cannot provide enough productivity to pay their own wages plus employment overhead and some profit.